So I've created my backup scheme as differential and scheduled it, I've performed one full backup to the programmed destination for the backup, then when I go into the application and run a manual backup Backup -> Backup With Scheme, it runs a full backup even though the scheme is set for Differential, what am I missing, I see no other way to perform a backup manually. Has anyone else run into this issue ? Without seeing the way you set up your backup, I can only guess that you left the box checked that says to run a full backup first. 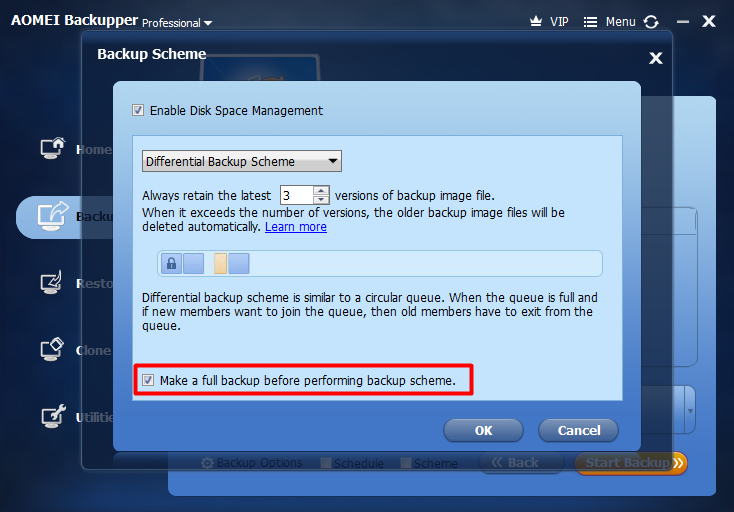 Start over with your backup definition and make sure that box is unchecked when you come to it. This is only a guess but is a place to start from. I'm doing this from memory (bad idea for an old guy like me) but there are 2 places where you can mark differential. One is in schedules-advanced and then again in schemes. When you do it in schemes, the first run will be a full and then diffs will run next time until you reach the limit set for how many to retain. Again, just fishing. If I remember correctly (which would be a miracle), if you run a scheduled backup manually, it will run a full backup. If you let it skip and do it on schedule, the next will be a diff. if that's the way it was set up. I used to have a full run on Mon and a diff on Weds and Fri. Pretty sure when I missed a diff for some reason and I ran it manually, it ran as a full. Just like you were getting. Not sure why but that's what it did. Did you tick the option below? If yes, there will be 2 full backups and the first one won't be deleted. How do you confirm it is a full backup, not differential? By the size of the file, there is a considerable difference in size between the full and differential backups I do on my drives, more than 100 GB difference. @Mrwizard, I sent you a PM several days ago on this. Check your mail. I am seeing the same thing. Differential backups are larger than full backups that are made 2 days earlier.